We'll head south after meeting at the Baja Trek pickup location at the border. After driving down the scenic coast of the Pacific Ocean or the wine country of northern Baja we'll stop in Ensenada for lunchtacos, a cantina or two, and/or a walk by the oceanfront. Afternoon will find us pushing farther south along the Pacific coast and camping on a Pacific Ocean beach near San Quintin/El Rosario or stopping for an overnight campfire among the rock gardens and cactus forest of Catavina. We'll start the day with a hearty Baja breakfast and make our way to Catavina to see the 1,000 year old Indian cave paintings. We'll do this if we camped by the beach the night before or after breakfast if in Catavina already. We then point farther south across cactus-filled desert to our destination of Bahia de Los Angeles on the Sea of Cortez side of Baja. The evening allows us to enjoy our dinner on the beach and gives us time to explore the tranquil Baja coast where we can dip our toes in the waters of the bay. From here on it is pretty much wide open. As the day progresses we'll explore the coast and soak in the local Baja vibes. Catch some rays, lounge on the beach, or go clamming on the estuary. How about a game of beach volleyball? If that's not enough, spend the day wandering through the hills or take a panga ride with a local pescadero. 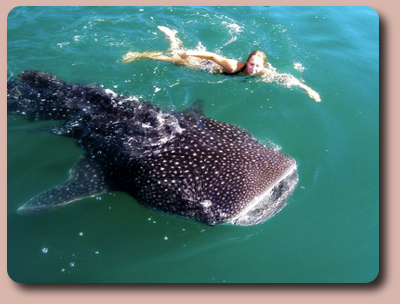 During certain times of the year the docile whale shark can be seen. At night we'll have dinner and stargaze. If you listen closely you may hear a coyote's distant howl riding on the wind as it calls to the guitars by the campfire. Finds us awakening to another glorious Baja California sunrise where we enjoy a lazy breakfast before we begin our slow crawl north. We'll stop either in the San Quentin area or Catavina if we missed it on our way down. At our Pacific beach campsite, the contrast between the rugged Pacific coast and the mellow Sea of Cortez will leave a lasting imprint on your mind. After sleeping in, we embark on a gentle drive north to Ensenada for a late lunch and walk around town. Then it's off and up the coast where we arrive at the Baja Trek drop off location in time for the night life. Adios amigos. Our adventures are designed to be flexible. Due to the nature of Baja travel the above itineraries are meant for representative purposes. We're going south of the border down Baja California way. 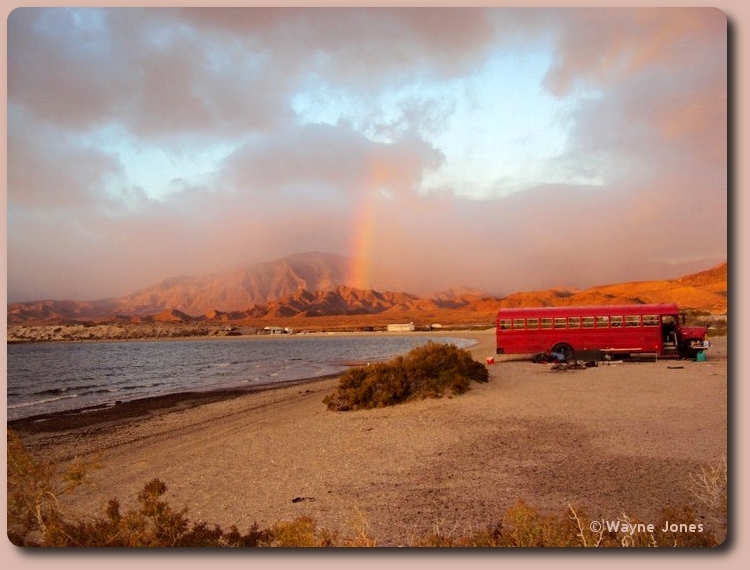 This trip heads down the Baja California highway for eight days of Baja sun and fun at the famous Bahia de Los Angeles! We take our time, make plenty of stops along the way, and soak up the Baja vibe. If you haven't yet, please check out our FAQs and Why Not Baja Trek to see what we're really all about and to make sure our travel style suits you! ". . . the open road is a beckoning, a strangeness, a place where a man can lose himself."